A Gospel driven Family: Tweeting through "A Weed in the Church"
A few weeks ago I had a great meeting with Scott T. Brown from the National Center for Family-Integrated Churches. During that meeting he offered me a copy of his book "A Weed in the Church". I was in the middle of finishing the previous book that I have already blogged about but picked up this new reading as soon as I finished. I decided to "Tweet" my way through this new book since I had, in only the first 50 pages, found a wealth of vital information for Christians, their families, and the church today. I will blog a book review once I have completely digested the writing itself. However, I highly encourage you to consider purchasing a copy for yourself. 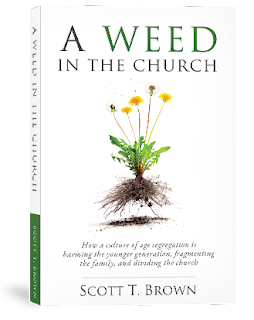 You can do so by following this link to their store: A Weed in the Church. I am only halfway through the book and it is an eye-opener.